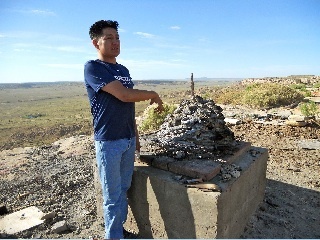 We are devastated to report that on June 14, 2011, Jake Koopee passed away in his family's home at Sichomovi Village on First Mesa. Jake was only 41. This is such a tragic loss of not only one of contemporary pottery's finest artists but also a kind and gentle person who was a good friend to many as well as a loving son and brother. Making this loss even more shocking is that just a few days before Jake's passing, our field trip group was warmly welcomed by Jake and his family. We watched Jake unveil and present an amazing vessel - what was to become his final piece of pottery. We then dined with Jake on a special feast prepared by his mother, Georgia. It was such a happy occasion, and it is so difficult for us to now make sense of the fact that Jake is suddenly gone from us. We are currently in the process of collecting donations for Jake Koopee's family. You can make checks out to the Wheelwright Museum of the American Indian, and please note on your check that it is in memory of Jake Koopee. That way, your check will be tax deductible. Marti Struever will be personally delivering the collection to Jake's mother. Feel free to send us cards and letters as well, for we will see that his family receives them. Below you will find our original "featured artist" write-up on Jake Koopee. In the 35 years that I’ve been part of the American Indian art community, I’ve remained true to one of my first loves in the field, Hopi pottery. Of particular interest to me are Hopi potters like Jake Koopee, who carry on the Nampeyo family lineage by incorporating Nampeyo motifs with innovative new ideas. Jake Koopee is Nampeyo’s great-great-grandson, albeit on his father’s side, and he is an extraordinarily talented younger potter. From Sichomovi Village, perched high on the cliffs of Hopi’s First Mesa, Jake creates a dazzling array of expertly painted designs on his finely crafted Hopi jars and bowls. Jake Koopee is exceptional in so many ways! 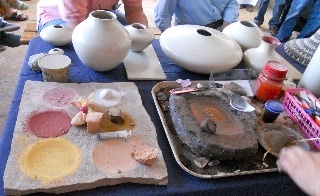 From hand-digging the native Hopi clay, to hand-coiling his vessels, painting his pottery using only natural plant pigments and brushes, and dung firing outside on the sheer cliff ledge of First Mesa, Jake Koopee is one of the few contemporary American Indian potters to still work in an entirely traditional manner. Jake Koopee forms his pots in an incredible range of sizes and shapes from very small to huge. He even creates ceramic figurative sculptures. Jake is adept at perfectly translating whatever his imagination holds into pottery design. Every piece that Jake Koopee produces is, therefore, absolutely unique. Jake Koopee’s Hopi name is Pato meaning “when the corn bursts.” He was given his Hopi name by ladies from the corn clan, which is the clan of Dextra Quotskuyva and Nampeyo of Hano. Jake usually signs his pots by painting a flute player, which represents one of his own clans, the flute clan. During the migration to Hopi, the people of the flute clan were responsible for bringing the water, so water is a common motif that Jake uses in his pottery. Take a look at Jake Koopee’s Hopi Maiden and Pottery Jar for a truly brilliant piece of pottery that beautifully reflects Jake’s incorporation of water into his pottery pieces. It is no wonder that Jake Koopee has won numerous awards including back to back “Best of Show” awards at the Heard Fair and Santa Fe Indian Market. For more on Jake Koopee, be sure and check out one of my Marti’s Adventures entitled A Visit with Jake Koopee.